Find the link Course Reserves in the middle of the page, underneath the heading “Research.” Click on it. Search the department and course number of your class, or search the instructor’s name. For e-reserves, type in your course password and access the item from your computer. WSU Libraries operates on an "Open Stack" system. That means that you must find the "Call Number" of the book, find it on the shelf, and take it to the circulation desk to check it out. We can help you with this! You may checkout (take home) up to 299 books at one time. For undergraduates, each book may be kept for SIX WEEKS. Graduate students may keep each book for a semester. If you need the book longer, you must renew it. Make sure that you have Cougar Card that is current and in good standing. Use our catalog (Search It). If you need help with this, please visit the Reference Desk on the 1st floor of Terrell Library. We are happy to help you find a book and locate it on the shelf! When you find a book, write down the call number (explained above). 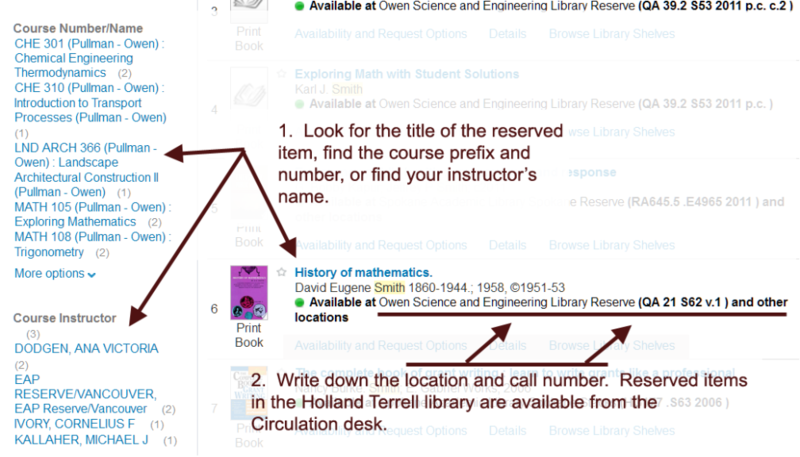 Use the stack chart to locate the book (or ask at the Reference Desk). Bring the book(s) to the Circulation Desk and show your Cougar Card. Remember to return your book by the due date! If you bring a book back late, you may have to pay fines. For more information, see our fines policies. 1) First, type your search into the box that appears on the Libraries website. 2) You may be prompted to login using your Network ID. We strongly recommend that you do this, as it will display a larger number of results, and will allow you to order from Summit. 3) When you get your list of results, you can REFINE the list on the left side of the page. For example, if you want a book immediately, you can click on Library: Holland/Terrell Libraries, which will show you materials that are located here in Pullman. If you want print books, you can click on Type: Print Books. This will narrow your list and make it easier to look through. 4) When you find a book that you like, you should look for two things. First, look for a GREEN DOT and the phrase "Available at Holland/Terrell Libraries." This means that the book should be here and on the shelf. Then, next to it, look for the CALL NUMBER (for more information on reading these, see the box below). This is the number you will use to find the book on the shelf (the book's address). When you have the call number, use our stack chart to find the location of the book in the library. If you need help, please ask at the reference desk!